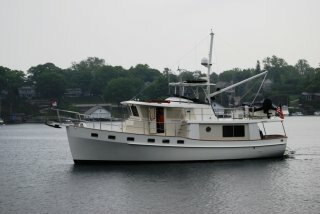 After a few weeks at the docks in Grand Haven, we are ready to once again head out onto Lake Michigan. We will slowly meander north to one of our favorite stops, Mackinac Island. Being Memorial Day weekend, we decide to hang around the docks for a few additional days. This turns out to be a wise decision. There is a constant stream of boat traffic parading back and forth through the harbor. We don’t want to join this parade. Being here over the weekend allows us to get to know some of the boat neighbors. Jeff gets an invitation from Butch, owner of Devil Dog Fishing Charters, to go out with him one evening. 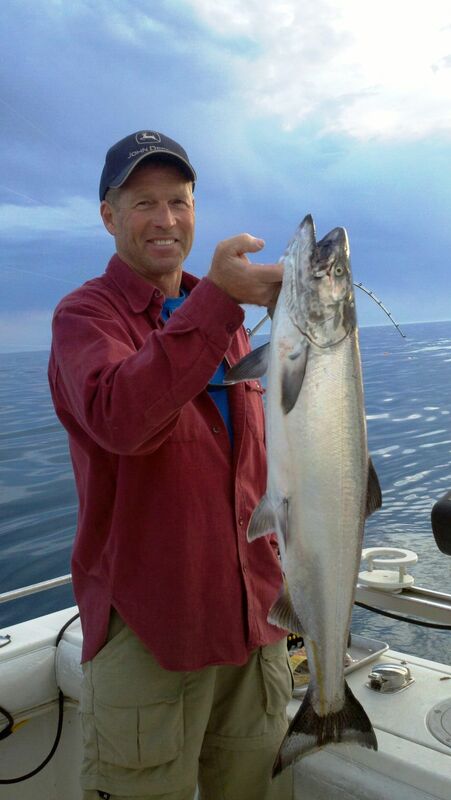 They come back with two nice size king Salmon. We have also become good friends with Dean and Robin, who have a boat just a few slips down and it is enjoyable spending several evenings together with them. We will miss North Shore Marina this year when we head south. It has become home. What a difference a day makes. 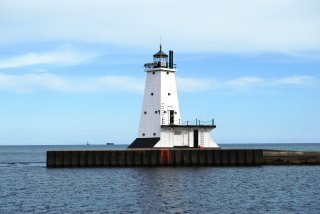 Leaving Grand Haven this morning, we see no boats out. Not a soul. Everyone is back to work. The seas are calm and we have an enjoyable trip north as we work our way up the Michigan shoreline. Ludington is a new stop for us. In past years we have bypassed this port. Once inside the breakwater, we travel ½ mile down the Pere Marquette River and find a nice spot to anchor for the evening. 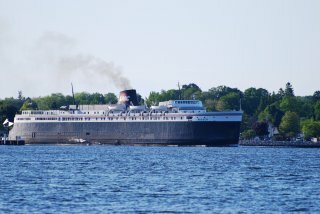 Ludington is the port for the car ferry, S.S. Badger. 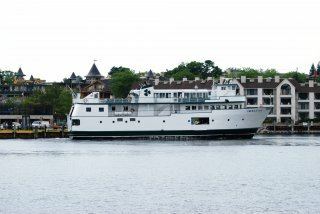 This steam ship has been ferrying passengers across Lake Michigan to the port of Manitowoc since 1963. 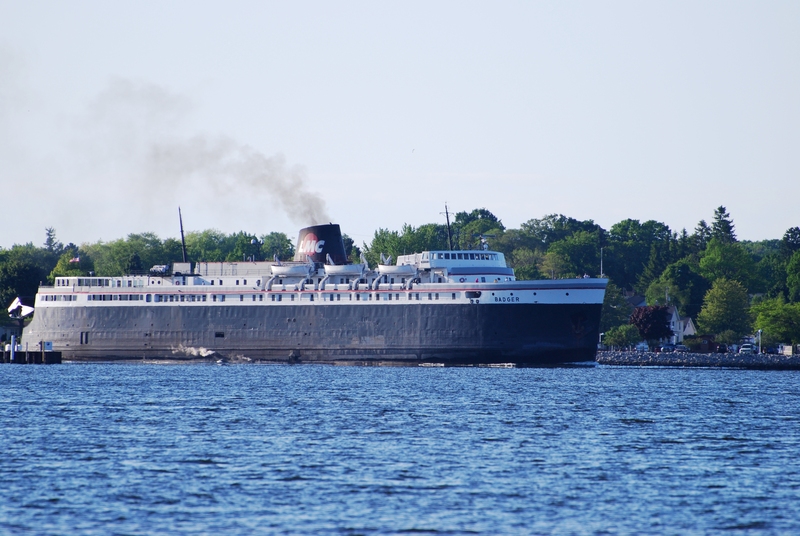 At 7:00 PM we hear her steam whistle blow as she enters the Luddington Breakwater. Shortly after, the massive ship rounds the bend and comes into view as she makes her way to port. She is impressive! After a night at anchor, we decide to head into the marina. 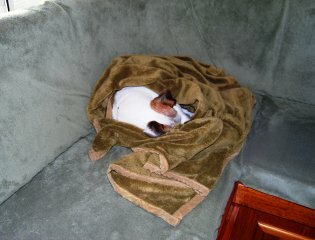 It is cold, windy ,and rainy. Harbor View Marina is first class with a very nice club house and exercise room. We enjoy the day exploring the town and getting a much needed workout. Our last stop of the day is to The House of Flavors. This Ludington landmark makes all of their 30 plus flavors of ice cream from scratch. Sebastian eagerly awaits his portion and very much approves of their ice cream. We were hesitant to leave port this morning as the winds have been blowing for the last few days from the north. The forecast calls for seas of 2 ft. or less with winds dropping later in the day. We delay our departure thinking that the lake will calm down as the day progresses. This also gives us a chance to use the marina gym one more time. At 10:00 AM we poke our nose outside the breakwater and find the lake calm with seas one foot or less. For the next few hours, we have a great uneventful trip up the Michigan Coast. What a difference a few hours can make. About an hour past Manistee, our last bailout port before Frankfort, the winds pick up to 20 knots and the seas turn ugly. What happened!! We check the weather forecast to find that it has suddenly changed to gusts up to 30 knots. The forecast still calls for the seas to be 2 foot or less. IT is bucking up and down as we pound into 3-4 ft. seas with an occasional six footer thrown in. Someone clearly missed the forecast. The next three hours are miserable as we take a beating. We cringe with each of these waves as we can hear the things in our cabinets constantly being rearranged. These short steep windblown waves are what makes the Great Lakes such a boating challenge. With no other boats around and a water temperature of only 53 degrees, this makes you pause and think of emergency procedures. One would not survive long in these cold waters if there was a problem. Even though there are numerous Coast Guard Stations along Lake Michigan, help would be at least 30 minutes away. We are very relieved to reach the safety of the Frankfort Breakwater. Having been here several times in the past, we know the anchorage well and are soon safely on the hook. Rain, wind, and cold temperatures are forecast for the next few days. After a very cold night at anchor, we decide to head for the docks where we can hook to shore power and run the heaters continuously. When at anchor, we must run the generator in order to power our heating system. After a warm night at the docks, we head back out to the anchorage. The sun is out and the thermometer is on the rise. We are able to do some exploring in the dinghy this afternoon. We find a nice landing spot across the harbor from the town of Frankfort. Here we discover a great coffee shop, The Trick Dog, just up the hill. From there it is only a short walk to the Michigan shoreline. 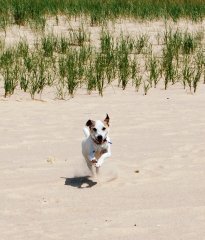 Sebastian enjoys some free time on the beach as he romps in the sand. It is great that they allow dogs on the beach. Sebastian is so happy he does several sprints back and forth. We haven’t seen him run like this in a long time. We enjoy the beach also as the Michigan beaches are some of the prettiest in the U.S.
What a difference a few days can make. As we exit the Frankfort breakwater, the seas are flat calm. Such a contrast to when we arrived. Again we see no other boats out. As we navigate through the Manitou Passage, we spot a Coast Guard helicopter practicing liter rescues with another Coast Guard boat. We feel good knowing they are around. We continue to have a beautiful cruise and are soon entering Grand Traverse Bay. We anchor just outside the small village of Northport. This northern section of Lake Michigan has crystal clear water with a nice sandy bottom. Our first attempt at anchoring does not go as smoothly as usual. While trying to set the anchor, we notice it continually bumping along the bottom. It finally catches but we are still uncomfortable with the hook and decided to pull the anchor up and retry. 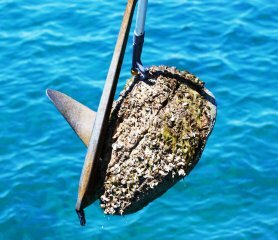 As the anchor reaches the surface, we have big surprise. Hooked on the anchor flukes is a huge slab of concrete. That is why our anchor would not catch and hold. Jeff tries unsuccessfully to knock this massive chunk loose. We finally lower the anchor back to the bottom and the concrete is knocked free. Our second attempt at anchoring is much better and we are soon hooked fast. We have a beautiful night on the hook enjoying the Caribbean turquoise waters. Before leaving , we make a quick stop at the marina to take on some fuel. They have the cheapest price on diesel right now at $3.79 gallon. Although we can hold 1000 gallons, today we only take on 250. We are hoping the prices will continue to come down this summer. Who knows? It is a short boat trip to our anchorage in Suttons Bay where we find a beautiful sandy spot just off the town docks. Inland Seas, a two masted educational schooner, is out on the water. 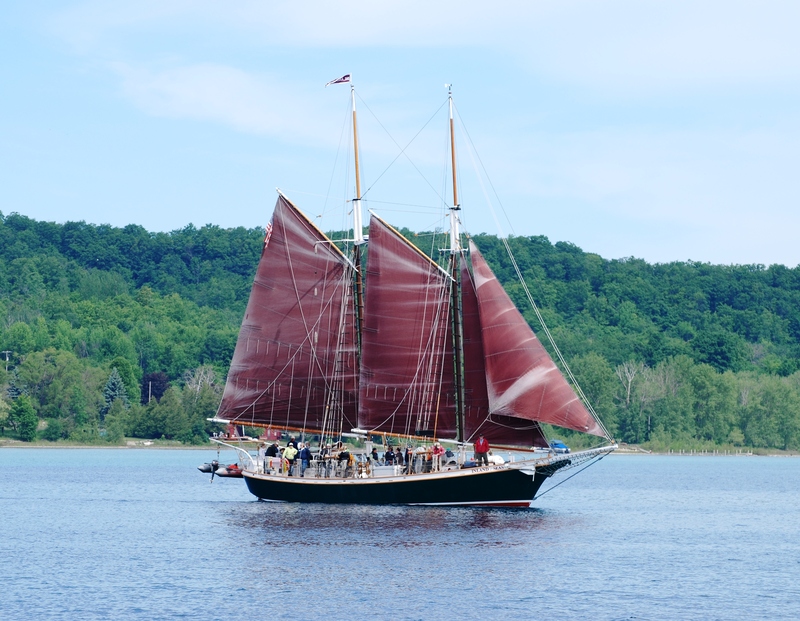 She is stunning with her burgundy sails. After a pleasant night on the hook, we awake to find IT now has a million guests aboard. The boat is covered with little bugs. The good news is they don’t bit but they sure do make a mess of things. We realize these flies are an important part of the aquatic food chain and from the look of our boat Suttons Bay appears to be very healthy. This morning we load the bikes into the dinghy and make the trip ashore. We find some day use docks at the marina where we can leave Time Out while we get in a bike ride. Leland, one of our favorite towns on Lake Michigan, is only 10 miles from here. We would have liked to stop in Leland with Idyll Time but there has been some shoaling at the harbor entrance and we weren’t sure we could get in. The ride through the Traverse Bay countryside is very enjoyable although somewhat hilly. The thought of their famous pretzel bread sandwiches and homemade beef jerky motivates us to peddle hard. We find the Leland Harbor busy with lots of construction and dredging activity. Maybe we will be able to stop here on our return trip south with Idyll Time. Our afternoon is spent enjoying the nice town and shops lining Main Street in Suttons Bay. Sebastian enjoys the exercise and especially our stop for his now favorite treat, ICE CREAM. We did learn however, that raspberry sorbet is not his favorite flavor. 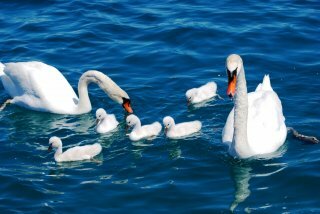 We return to Idyll Time to find a family of white Swans out for a paddle. This family appears to be experienced in begging for food. They eagerly consume all of our wheat bread, ritz crackers, and cheerios. Curious about all the commotion, Sebastian pokes his head through the transom door. The male becomes very agitated with this and hisses menacingly. Sebastian quickly retreats inside. We have another beautiful night at anchor. From Sutton’s Bay, we continue north to the harbor village of Charlevoix, one of our favorite ports along this section of Lake Michigan. On this visit, we decide to try anchoring in the beautiful harbor of Round Lake instead of staying at the docks. We have never tried anchoring here before because the harbor is so deep. We drop the hook in the shallowest spot and are still in over 40 feet of water. Normally we would let out somewhere between 5-1 to 7-1 ratio of chain to depth. With not much swing room here, we can only let out 110 feet of chain. The harbor does have good holding and is very protected from the winds so we should be OK. From our several years of cruising, we have learned that we much prefer anchoring out to being tied at a dock. 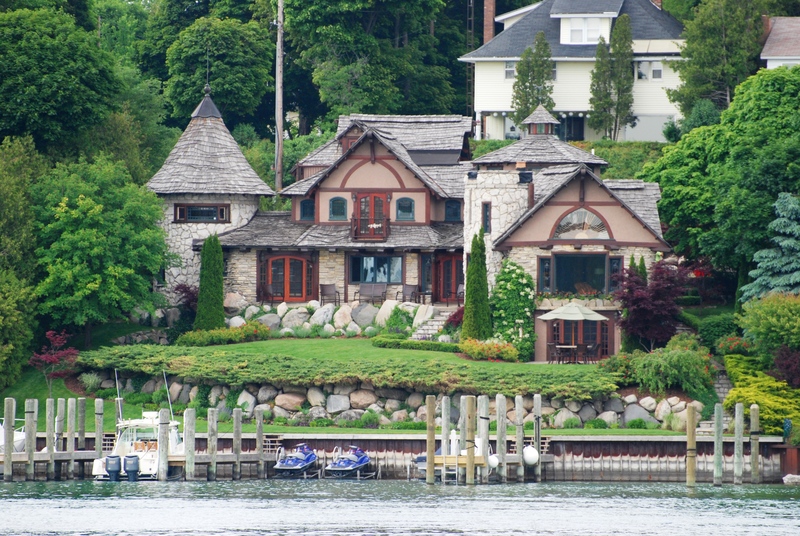 We have a great spot just off the town docks and also surrounded by the beautiful summer mansions lining the shore. From our back deck we enjoy several days of people and boat watching as the harbor has a constant stream of traffic coming and going. As we hear the bridge opening bell each hour and half hour, we glance up to see what boats are entering the harbor. 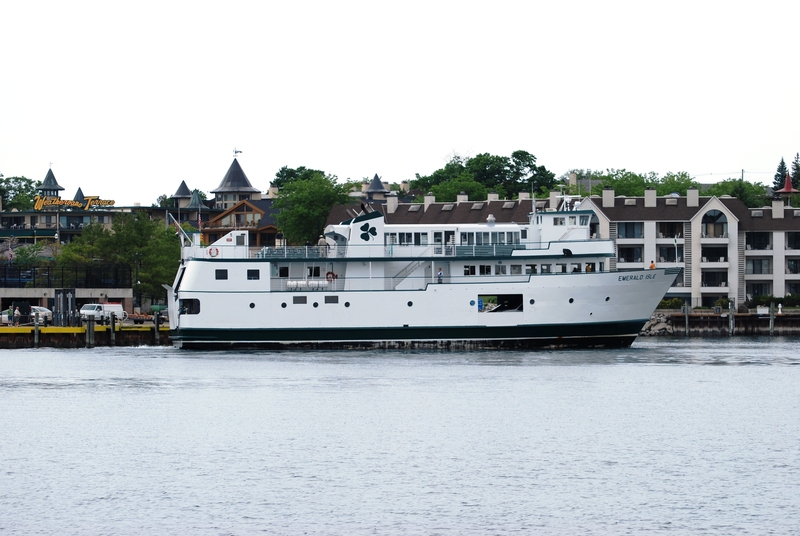 The Emerald Island car ferry makes several trips daily from here to Beaver Island. Our good friends Marty and Suzanne aboard the Krogen Alizann, cruise into the harbor from their cottage on Lake Charlevoix for a great dinner at the Edgewater Bistro. We have a wonderful time visiting with them and catching up. We also stay busy with necessary boat chores along with grocery resupplying, mail pickup, and hair cuts. After several days enjoying our idyllic anchorage, we decide to pull anchor and do some exploring on Lake Charlevoix. From Charlevoix, we have an easy 14 mile trip down to the end of Lake Charlevoix and the small town of Boyne City. Here we are the only transient boaters at the town docks. We end up staying two nights due to some strong winds. This gives us a chance to get in Several bike rides. We enjoy exploring this quaint town and it’s nice shops and restaurants. Everyone here is extremely friendly and happy to have visitors. After a quick trip to the local farmers market, we head back to Charlevoix and again anchor for the evening in Round Lake. From here we will continue north on Lake Michigan. This entry was posted on June 16, 2012 at 12:38 am. You can follow any responses to this entry through the RSS 2.0 feed. You can leave a response, or trackback from your own site. 1 Response to "Lake Michigan Summer 2012 Part 1"
So you too found those NOAA weather and wave forecasts are about as good as boating in Michigan in January! Lake Michigan changes quickly and the wave forecasts are rarely accurate. I find web cams and buoy observations as helpful add ons to the forecasted conditions. As you know, there are a number of them accessible on the internet. We leave for a 12 day trip on Friday. We are heading to Milwaukee then on up to Door County, Washington Island, Fayette and back to Grand Haven by the fourth of July. Planning another 11 day trip in August (16-26) likely to many of the places you have just been. Perhaps our paths will yet cross out there this summer. Travel safely. Calm seas and warm breezes to you!